Say hello to Henry - the knitted hot dog draught excluder! Isn't he really adorable? This was one of those patterns that I saw and immediately longed to make it for myself because the finished project looked so inviting; bright colours, expressive face, and useful all at the same time. 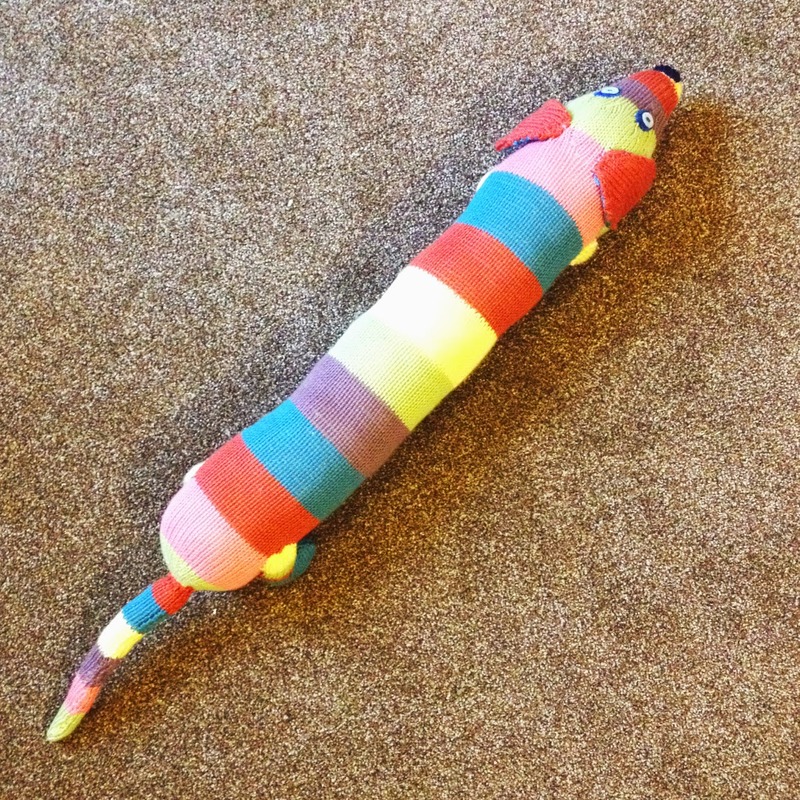 Of course, knitting him didn't come without some problems, but don't all patterns? The pattern for Henry (so named by me) came from this special issue of Woman's Weekly; Best of ... Our Knitted Toys (Dec11/Jan12) which I picked up from an old newsagent that was closing down a year and a half ago when I worked for a summer in a school uniform shop. 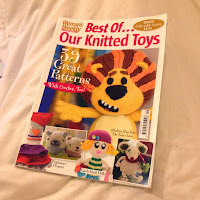 As such it is unlikely you can buy this magazine now, but the original pattern came from Knitted Nursery which you can buy online. 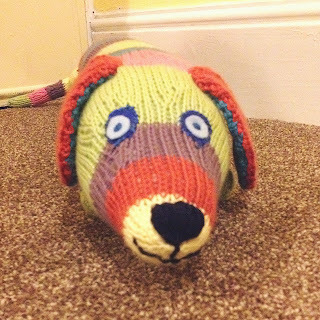 Like I said, as soon as I saw the knitted dog I wanted it for myself! However the pattern recommended Rowan Handknit Cotton DK which, at £4.50 per 50g ball, was a little highly priced for me, fresh out of uni with a summer job! However I was able to treat myself to the yarn a few months later, and I chose colours that were a little more subdued that recommended in the pattern (which is intended for a nursery after all) but still bright enough to keep up that cheery rainbow look! I had never knitted with cotton yarn before, and I found it initially frustrating using the new material (you can read about my frustrations in an earlier blog post). This frustration, combined with the monotonous nature of the stocking-stitch pattern (the break up of colours wasn't quite enough to keep it interesting) meant this was one of those WIPs that dragged on for a long long time. I finally picked up the needles again months later, only to find that my knitting had improved so much to avoid the previous problems I had with knitting with cotton, making it look like a completely new person was knitting the dog. So I unravelled the whole thing and started again! Now that my knitting had improved and worked up more quickly, I was able to knit up all the components for Henry in a much shorter length of time and felt less frustrated by the straightforward nature of the pattern. Once the pieces were finished I had a lot of sewing and stuffing ahead of me ... which wasn't ideal when all I wanted to do was knit! So once again I put aside Henry to work on other projects. Finally, perhaps another month later, I sat down and got him finished - and I must say I am very proud of how he has turned out and how he is helping keep my new bedroom warm in the cooler nights. 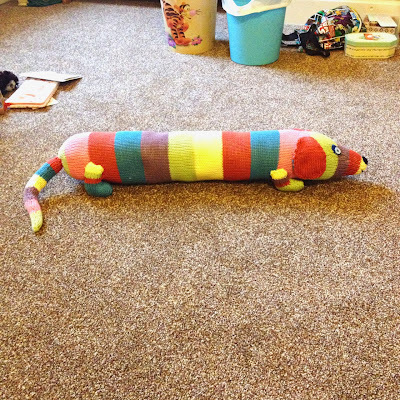 And so, a long long time in the making but here he is, and he is definitely one of my favourite finished projects! I would recommend this pattern for intermediate knitters because, even though the shapes are made with straight forward increases and decreases, simple colour changes and completely stocking stitched, there are a lot of components to knit, knitting with cotton takes some practise, and sewing the pieces together wasn't as easy as knitting them - its a fiddly ol' business!